We left Haahopu this morning about 0700 hoping to beat the afternoon swell and wind and get north to Anaho Bay. Out of the gate on the west side of the island it was smooth sailing or should we say motoring? No sails up because it is just a 12 mile run. Well, I guess I should say, it should have been. The moment we turn east on the north side of the island it is back to the same bashing we had yesterday. We beat into it for about fifteen minutes and then said, “Hell no!” After all, there are thousands of beautiful bays between here and New Zealand, we can’t see them all so this is just one we will have to miss. Plus, our dear friends Ed & Linda of SV One Fine Day are sitting in Taiohae Bay and there’s always a good supply of cold beer and fun times when they are around! Turning around was great until we arrived at the south end of the island. We had to head east at the south end to get back to Taiohae Bay. Remember, here is where the generator is being delivered. Just before we hit the southwest corner of the island the waves start coming and when I say coming, it was worse than I’ve ever experienced on Dazzler. They were short frequency and averaging 6’-8’ but every couple of minutes a 12+ footer would come crashing over the bow and into the cockpit. Dan sent me below where I could be safe and dry but he was getting soaked. The crazy part is you expect this type of thing when it’s stormy but it’s sunny and beautiful today. And, I’m not sure being below is good for me as I can’t see what’s coming at us so everything is status quo and the next second I am being bounced off my seat and I just see a flush of water rolling past the port lights. Not going to lie, I did say a few prayers down here. Dan is doing an amazing job running the ship but I figure a few prayers can’t hurt. 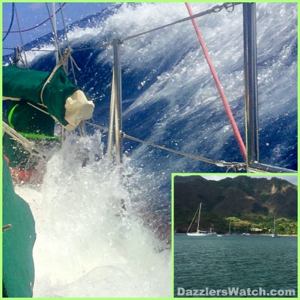 As we continue to beat through the turbulent ocean Dazzler is taking a pounding. With each crash into the trough of a wave you can hear her grown and creak. I’m hearing noises I’ve never heard before and I’m not liking it a bit. Of course I know she’s strong and built for this but it still doesn’t make me happy. After about 2 1/2 hours of beating we finally arrive at the entrance to Taiohae Bay. Oh Lordy…what a beautiful sight! We make our way to the anchorage and find a good spot near Ed & Linda. We dropped the anchor and are now enjoying a few well deserved, ice cold Hinano beers. We will be here at least a week and then will head for the Tuomotus. At least we know that’s a downwind, down swell ride. We’ve decided no more upwind rides unless it’s a “got to get to safety” type of thing. WOW!…now that’s a hell of a story! !…I’m there with ya! at least its warm and the water is not 52 degrees like on my august vacation in the Gulf Islands! !…Glad you have a yar ship and able old salt at it’s helm…sail on soldiers…see you in 3 years! Well…it’s always an adventure out here. Guess that’s why we all love it so much!